Throughout the five games Spain has played in the 2010 FIFA World Cup, Xavi has been one of its most important player. He has passed the ball more than anyone else in his team, and also more than anyone else in the World Cup (up to quarter final stage). He has passed the ball 464 times (92 times/game) with a passing accuracy of 80%. A node is authority-central to the extent that its in-links are from nodes that have many out-links. Individuals or organizations that act as authorities are receiving information from a wide range of others each of whom sends information to a large number of others. Technically, an agent is authority-central if its in-links are from agents that have are sending links to many others. The scientific name of this measure is authority centrality and it is calculated on agent by agent matrices. In other word, Xavi is authority central because he received passes from other players who passes the balls a lot (i.e. played the distributor role in the team). 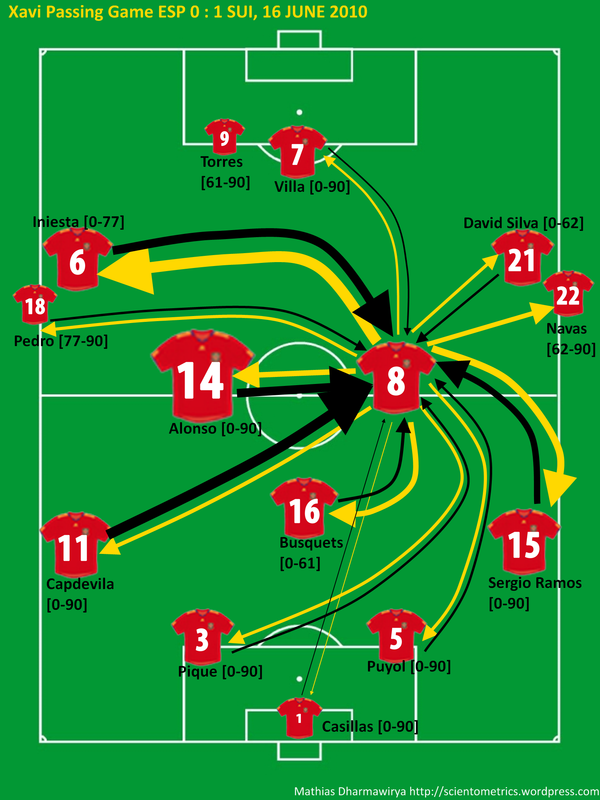 Let’s visit Xavi passing game during Spain’s first game against Swiss (which it lost). *The size of the jersey indicates the authority-centrality of each player. The thickness of the line indicates the frequency of passes between Xavi and the other player. Very interestingly, Xavi only passed the ball successfully to David Villa 3 times throughout the whole game. This fact is even more surprising since Torres only came into play in minute 61 replacing Busquets (note: Xavi did not have any successful pass towards Torres in this game). As a comparison, in Spain subsequent games where Torres played the game from the beginning, Xavi had 5 completed passes towards Villa (vs Honduras), 5 (vs Chile), 18 (vs Portugal), and 8 (vs Paraguay). And successful passes towards Torres are: 3 (vs Honduras), 1 (vs Chile), 5 (vs Portugal), 2 (vs Paraguay). It can also be observed the preference of Xavi to pass towards Iniesta rather than to David Silva. And also he passed the ball more often to Sergio Ramos rather than to David Silva. David Silva is definitely a competent player, but it doesn’t seem he meshed well during the match. And Xavi (one of Spain most influential player) seemed not very comfortable playing along with him (indicated from the number of passes among them). Guess what, this match against Swiss was the first and also the last game (upto quarter final) for David Silva. He did not even enter other matches as a substitute.